Inquisitive two year olds enjoy daily small group educational experiences. With their teacher as their facilitator, they will have the opportunity to talk and learn from each other as they explore new content. Our two’s classrooms have a variety of learning centers that allow children to plan their play. Blocks and building, imaginary play, math and science, language, music, art and sensory centers provide a rich leaning environment. Young learners enjoy the process of creating more than the product they create. We encourage them to discover their creativity through a variety of exploration small group activities. Children have the opportunity to mold, squish, splash and pour with different materials. We facilitate the children with a variety of open-ended materials. This allows the children to use the materials in a creative way. Some examples include: boxes, paper, tubes, plastic lids, fabric scraps, etc. Not only do children love to explore these materials, but as they experiment and combine them in different ways, they are also learning. Language- Our teachers plan daily small group language activities. We create a balanced approach to literacy by incorporating the following types of activities: Puppets, Felt Stories, Dramatic Play, Variety of Books and Matching Games. Science-Thinking & Curiosity. How does it work? Where does it come from? As children wonder about the natural world and how it works, they are engaged in scientific thinking. We encourage this for example by providing magnifying glasses to further their observation. Math- Two year olds use mathematical thinking to understand their world. Through a variety of integrated small groups our teachers facilitate their use of mathematical thinking. How much? How big? How many? What comes next? These are all important math questions that children can explore. Creative Art- Art for two year olds is all in the exploring of art materials. Teachers encourage their little artists to use their senses to experience the process of art. We provide a variety of activities that include the following: painting, stamping, scribbling, smearing, gluing, sticking etc. Sensory Activities- Each of our classrooms are equipped with a sensory table that allows for hands-on exploration of various textures, materials, etc. 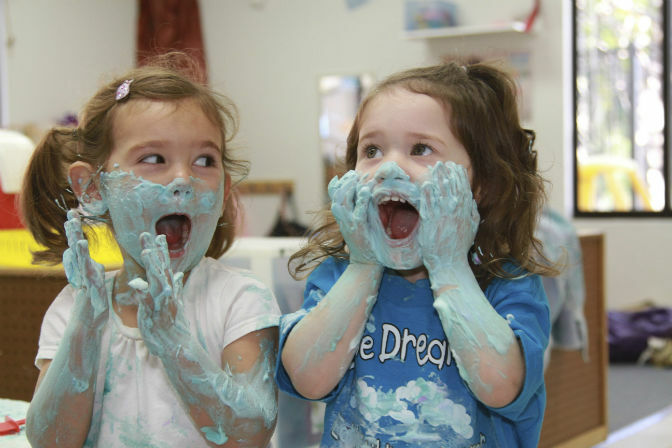 You will be amazed at the variety of activities we plan, to engage children and their five senses.